Some creatures you just half to laugh at even when they have the power and will to be dangerous. The ineffable Nancy Pelosi is most definitely one of these things. It’s actually fun watching her twist in the wind and whine, as only the frustrati among America’s domestic enemies can whine, now that America has arisen from it’s Liberal fever dream and has begun the arduous process of retaking our nation and restoring it to its proper form and glory. To my Republican friends: take back your party. So that it doesn�t matter so much who wins the election, because we have shared values about the education of our children, the growth of our economy, how we defend our country, our security and civil liberties, how we respect our seniors. 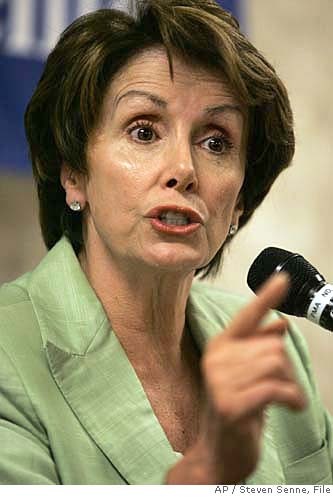 Pelosi presents an odd problem. It’s too stupid and evil to be allowed to live and too pathetic and comical to exterminate. Its behavior does make sense though. It has seen the American people rise up and place our representatives in political office and has nothing left to it but to beg for establishment GOP, mostly RINOs and special interest shills, to do as the Democrats had done and “take back” their party from we, the People. This entry was posted on Friday, April 15th, 2011 at 5:43 am and is filed under Politics. You can leave a response, or trackback from your own site.